Dynamic generation of smart, thin and mobile user interfaces (UIs). Use newlook to rapidly webface and create new UI’s. Multiple Audiences: Your internal ‘experts’ and knowledge workers have different needs to executive management and those occasional access customers. Multiple Devices: Mobile devices will soon be the most popular web access device - you need to develop a compelling User Experience for multiple devices like smartphones, notebooks, workstations and tablets. Multiple UIs: Why can’t your customers access your applications the way they want to? Could you improve user satisfaction if they could access your IBM back-end functionality in their preferred UI like Outlook, Google, Notes or SharePoint? newlook’s multi-channel support means it’s easy to deliver the optimum UX to different audiences using different devices. Composed primarily of pre-existing functionality, composite applications deliver streamlined business processes, rapid ROI and a rich user experience. 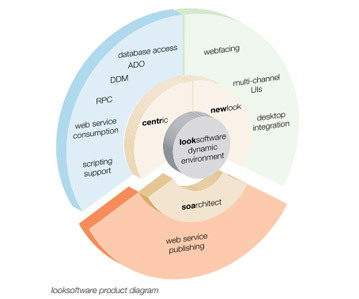 newlook supports a rich set of GUI controls, desktop integration, web services and direct database access to connect multiple applications from multiple platforms together easily. newlook UIs are suited to both non-invasive and invasive modernization. The closer you look, the more flexibility you will find. UIs can consume web services - at the client or at the server. UIs can connect directly to your choice of client or server-based logic including RPG (including full support for IBM’s open access for RPG), COBOL, C# and Java. They also provide easy connection to any popular database. Also known as rich clients, smart clients provide the richest function, built-in support for web services, desktop integration and the fastest performance demanded by those that spend much of their work day with your applications. Smart client GUIs are typically plugin-based and are preferred by information workers and medium to heavy transaction-based users who need premium functionality including ‘type ahead’ support. Rich Internet Applications (RIA) like Silverlight provide the reach of the web with rich functionality and aim to deliver the best of rich and thin GUIs. 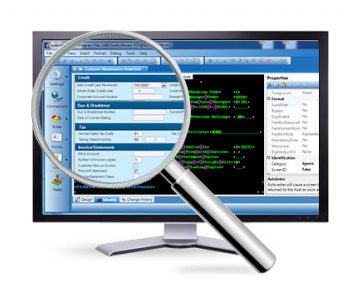 The popularity of zero deployment GUIs continues to grow with increased functionality making thin client an easy option for instant global access. newlook reuses existing GUI designs and designs new forms optimized for the ever-changing mobile marketplace.